Turbosound have upgraded their established Milan range, with the help of some technology borrowed from sister company Klark Teknik. I spent some time with the previous range of Turbosound Milan self‑powered speakers, and I remember liking them quite a lot, so I was more than a little interested to get my hands on the latest models. 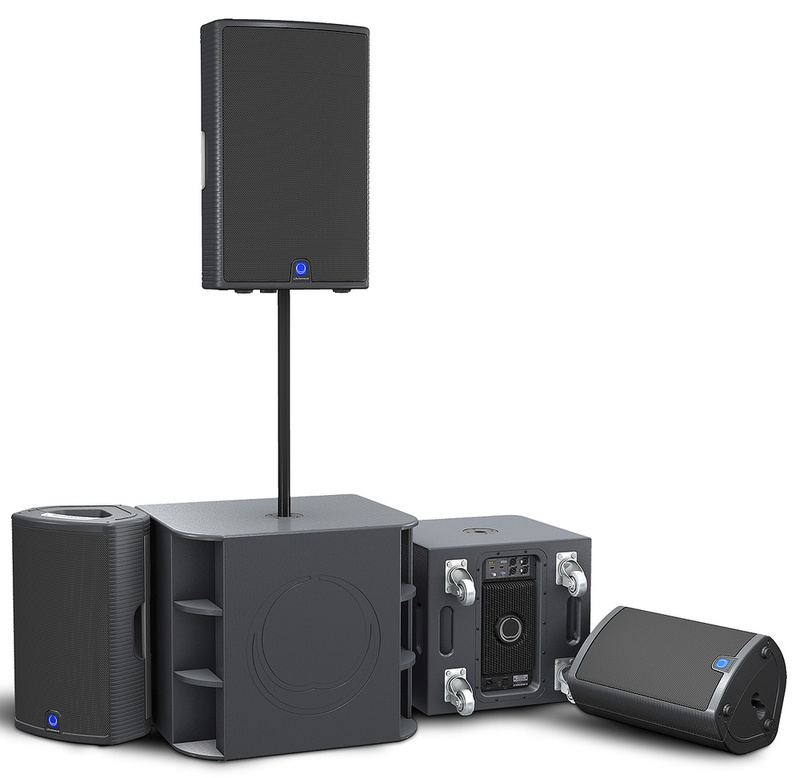 The new updated and uprated Milan series are outwardly similar in appearance, and the model range consists of three full‑range units designated M10, M12 and M15, and two subwoofers, the M15B and its larger sibling the M18B. The model names reflect the diameter, in inches, of the LF driver in each case. The cabinet shapes haven't changed dramatically, and the Milans retain their crisp clean look with a stylish combination of curves and straight lines — sort of 'curvy with edges' you might say — and it's good to keep physical and cosmetic compatibility with the previous versions. It's an effective look and I do like the subtle overall finish, which would look the part in a rock pub or a fashion show and most things in between. Although the new models retain the shape and names, the Milan speakers are very different beasts now, with new digital signal processing, power-amp stages and drivers. 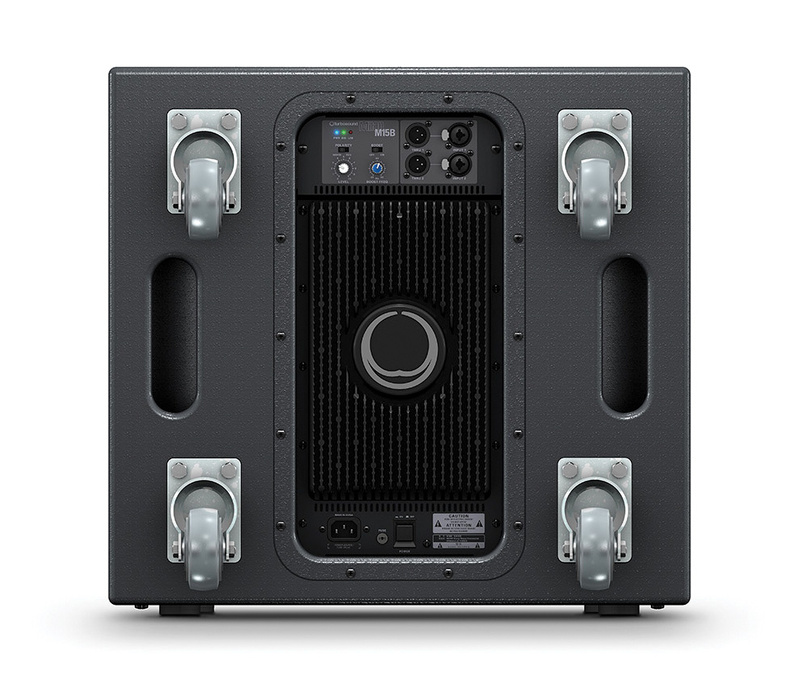 For portable live‑sound products the power‑to‑weight ratio is an important selling point, and the range has been given a power hike with all‑new Klark Teknik Class D amplifiers and active bi‑amp technology replacing the previous single‑ended amp module and passive crossover design. The new Milan range has been produced very much with a competitive price in mind, and one factor in achieving this — whilst retaining the Milan's position in terms of audio performance — is to say goodbye to the previously used and increasingly costly neodymium drivers, and move to tried-and-tested ferrite magnet technology instead. This means, of course, that the new Milans will weigh a bit more than the old ones; for example the Milan M15 is now 27kg (about 5kg heavier than before), but for me the performance-to-weight ratio is still very good and compares well with similarly powered products on the market. Another reason why Turbosound are able to bring the Milan series to market at this price point is that all their components are sourced in‑house, with complete control of the manufacturing process in parent company The Music Group's own facility. As no third‑party vendors are used, the company's production costs (and, of course, quality control and availability) are under direct control, and Turbosound have always had a good reputation for spares availability and standing behind their products. The Milan M10, M12 and M15 share the same control panel layout, which is nicely laid out and uncomplicated. 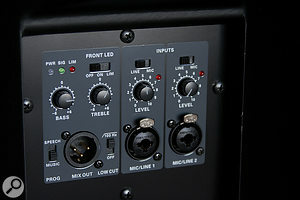 There are two identical input channels which have a balanced XLR/TRS-jack dual-input socket (which also accepts unbalanced jack sources), an associated level control and a slider switch for selecting microphone or line‑level sensitivity — you can plug microphones straight into the Milan for a simple vocal setup without the need for an external mixer. There's no phantom power available at these inputs so dynamic mics or battery‑powered condensers are the options here, and it would also have been convenient to have a pair of phono inputs on one channel for connecting a playback device. 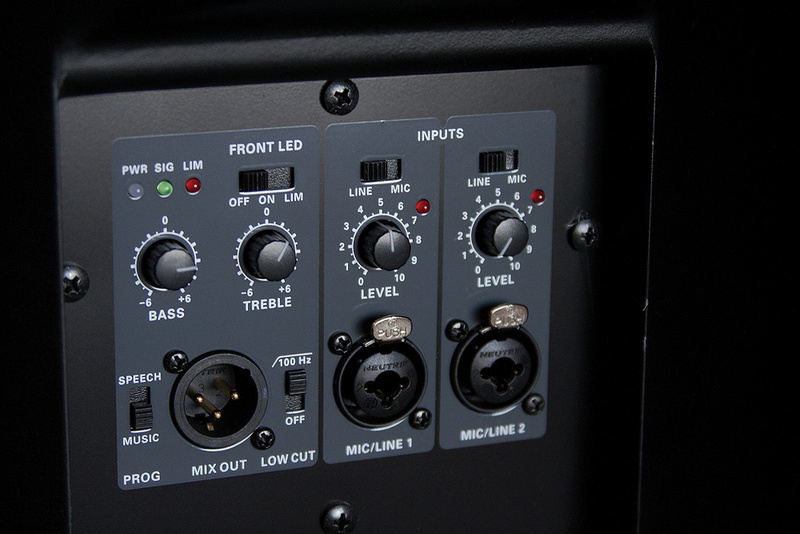 The resultant input mix is controlled by the 'master' section, which provides a simple two‑band shelving EQ, an EQ contour preset switch with 'music' and 'speech' settings, and a 100Hz low‑cut filter, which would generally be deployed when using the unit as a wedge monitor or with a subwoofer. The treble and bass controls provide up to 6dB of boost or cut based on the shelving corner frequencies of 12kHz and 90Hz, respectively. I like the choice of frequencies here (keeping the bass control nice and low avoids a lot of potential boominess and 'boxiness' if boosted too far), and the maximum boost level of 6dB should prevent over‑enthusiastic use of EQ by inexperienced users while still allowing effective control. The two‑channel mix signal is available at a balanced XLR output for onward transmission to another speaker or linked system, and this output is post‑EQ but not post‑filter. This is useful as it ensures that your already‑modified signal will be sent to other speakers down the line, but does mean that all the downstream units must be set with their controls flat or you will be applying the EQ more than once. The speech/music preset is useful and provides a quick starting point when using the full‑range speaker for public address or vocal monitor applications (I tried this in the open air, and using the 'speech' setting does help clarity and projection, especially when there are other competing noises). One of the huge advantages and conveniences of self‑powered speakers is their integrated protection, which the user can, to all intents and purposes, forget about so long as there are no warning lights flashing and everything sounds clean. There are two signal‑related LEDs on the Milan's rear panel: one (green) which indicates that the input signal has reached ‑6dB, and another (red) which shows that the limiters are operating. As far as the green signal LED is concerned I think this is more useful than the more common 'low‑level signal present' indicator found on many active speakers, as it indicates a good healthy input level and is therefore more useful as a setup tool. A further nice touch is the ability to switch the front-illuminated logo not only on or off, but also to reflect the limiter LED status, which is a useful thing to be able to see from a front‑of‑house mix position. Internal signal processing and amplification now makes use of shared technology with Turbosound's stablemates Klark Teknik, in the form of the latter's amp modules (now with higher peak power capability of 600W on the M10 and 1100W on the M12 and M15) and DSP. As mentioned earlier, the full‑range units are now fully bi‑amped with active crossovers. The move from passive crossovers is a major step forward from the older versions and will allow better energy transfer to the drivers and more precise control over the crossover areas. The Milan two‑way boxes also make use of the 'converging elliptical waveguide', which is a proprietary Turbosound technology originally developed for their NuQ series. 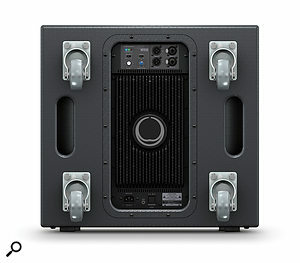 The M15B and M18B subs are of traditional birch-plywood construction, and feature increased peak power of 2200W on tap. Each sub has two inputs, which are summed to the internal amplifier (ie. you can connect left and right stereo signals from the mixer) but each has an individual 'thru' output which is a full-range input pass‑through, not high‑pass, with the necessary filtering applied when the signal reaches the full‑range boxes. When setting up the Milan as a full system you'd generally connect the incoming signal to the subs first, not the other way round, as the mix output from the mid/tops is post EQ. The subs have the same power/signal/limit LEDs as the full-range units, and a polarity invert switch, as you'd expect. An interesting feature is the boost circuit, which introduces a smooth (Q=1) fixed 3dB of gain centred between 40Hz and 90Hz, set by a rotary control. It works smoothly and I found it effective when compensating for different sub placements in different spaces, for example when the subs have to be placed on a raised stage. As Turbosound had sent me a pair of each version of the full‑range speakers and one each of the two subwoofer types, I was able to try out different combinations within the range. All models were easy to set up; connectivity is very obvious The mid/top speakers include a basic two‑channel mixer (both inputs can be set to mic or line sensitivity), as well as high‑pass filtering and a switchable 'speech' preset EQ. and straightforward, and a whole four‑box system can be set in place and working within 10 to 15 minutes. Switch‑on was quiet and uneventful as the speakers are automatically muted for a short time on powering up, and I did double‑check that the input-sensitivity switches on the top boxes were set to 'line', which is easier to see on the Milans than on some others because they have sensibly used a slide switch rather than a push in/out button. The different full‑range models are obviously intended to suit a variety of applications, and even at modest volume levels and in the relatively confined space of my studio they did exhibit differences in sound character. Firstly, I tried the full‑range cabs (singly, with a mono source) on their own without subs, then I added subs and paired them up in every combination. They say you should never make too many assumptions, but I had already decided that I was going to like the 'middle ground' of the M12 paired with the M15B sub, as this format combo is what usually works best for me at smaller live venues. I expected the Milans to sound pretty good, and they certainly did: the smooth, round sound I'd liked about the previous models was still there, with good clarity at both low and high listening levels. The M12/M15B setup I tried first had a sort of 'hi‑fi' sound about it, and the overall programme balance was maintained as I increased the volume right up to the loudest the room could take. I tried various types of material, from speech to rock to big‑score film music, and all was sounding good to me — the Milans are what I'd describe as an 'easy listen', and whatever development has taken place in terms of increased power and driver design hasn't been at the expense of sound quality. I swapped out the M12 for the M10, which had a generally similar overall balance, with perhaps just a touch more upper‑mid-range emphasis at louder levels, but still clear and sweet — very similar on lower‑mid-range and bass material, and pleasingly free from harshness when run loud. I was, however, surprised at the difference when I switched to the M15 mounted over the M18B sub. There was instantly more mid‑range authority, which brought out the vocals particularly on my mainstream rock/pop tracks, and especially at medium‑to‑high volume. There was a general liveliness and solid mid‑range power to the sound, which would steer me toward favouring this combo for medium‑sized gigs. I took the speakers out into my landlord's paddock, which is an excellent place for playing with speakers as there's literally nothing apart from open countryside for them to fire at. Projection and clarity was very good, and a good balanced output was maintained throughout and slightly beyond the horizontal coverage angle The M15B, with castors fitted. The subwoofers' control panels are simpler than the tops', providing access to the two inputs and thru outs, as well as a polarity invert switch and a sweepable bass-boost option. of 90 degrees. The M10s and M12s performed very nicely on a speech‑only test (using some recorded test tracks as well as a live mic), and switching the EQ preset to 'speech' and using the low‑cut filter is quite effective at reducing wind, breath and handling noise. A pair of M10s on their own would do very nicely for smaller outdoor events. I used the M12s on their own as a vocal system at a live gig with my 20‑piece band and the sound was clear and warm; our female singer liked using them, and because we had positioned them to each side and slightly behind the line of the vocal mic she (and I) could hear clearly enough without needing to rig the M10s as floor monitors. In terms of output level, the Milans have power in abundance, and the M15B and M18B subs can deliver a body‑pounding level of clean, solid bass should you require it. The Milans are easy to set up and are also easy to carry and transport. The M10, M12 and M15 have injection‑moulded enclosures that are strongly made and well finished, with strong convex steel grilles, which appear sturdy enough to withstand life on the road. I like the foam backing behind the grille, which offers additional moisture protection and looks good too. The carrying handles are stylish rather than comfortable, but they're strong and have plenty of space behind them for your hand (the smaller M10 doesn't have side handles). The top handles are useful when loading them into a vehicle and for shunting them around, and I like the dual‑angle pole-mount sockets, which enable the speakers to fire downward in smaller venues. The plywood M15B and M18B subs have handle openings machined into the rear corners, which means they can be easily carried face down between two people; I managed to pick up and carry the M15B on my own but I'd need a hand with the larger model. Both subs are provided with built‑in castor mounts (the fixing bolts are already in place) and fitting these would certainly be something I'd recommend. All the cabinets are fitted with good non‑slip rubber feet that are recessed into the bottom surface, and the overall impression is of a solid, sturdy and stylish set of speakers. I liked the old Milans, and I like the new ones even more. 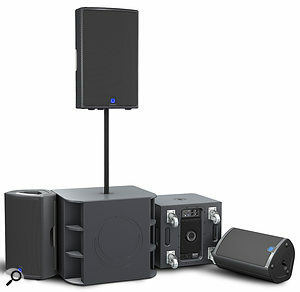 They sound and look good, and they are easy to set up, with a sensible feature set. The loss of the neodymium drivers has, I think, been more than outweighed by performance increases and a street price which offers a lot of performance for the money, and puts them firmly on the portable live-sound shopping list. Also worth checking out are the JBL PRX series, Yamaha's DXR and DSR range, the QSC K series, DB Technologies' Flexsys speakers, the HK Premium Pro models and Mackie's HD range. The 'Milan' name of these speakers comes from Turbosound's past period under Italian ownership, and was designed to underscore the 'European' visual style and sound when the line was first introduced. As it happens, one of my favourite recordings for testing speakers is an LPO/Parry recording of 'Dies Irae' from the Verdi Requiem — that's the Guiseppe Verdi who lived for a while, died and was buried (twice!) in Milan, where this music was first performed. Not what your typical portable PA rig would often be used for, but this material is extremely challenging and can easily sound horrendous on inferior systems. It's music that cries out to be turned up loud (full orchestra with eight trumpet parts and double chorus marked up to ffff — you get the idea), so I did just that. The result was frighteningly powerful, with a surprisingly clean mid-range coming through, which compared pretty well with my largest set of studio monitors — easily listenable and enormously exciting. You really have to try it. Strong, sweet sound which is maintained at high output levels. Strong in the mid-range, particularly the M15. Would like phono inputs on the smaller M10, perhaps. A worthy upgrade to an already good system, with the M15 and M18B combination providing particularly impressive performance. M10 €399, M12 €499, M15 €599, M15B €799, M18B €899. Prices include VAT. M10 $399.99, M12 $499.99, M15 $599.99, M15B $799.99, M18B $899.99.